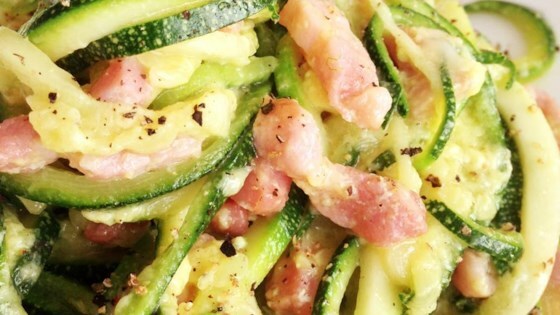 "A twist on the traditional carbonara using zucchini squash noodles and omitting the cream for a gluten-free, low-carb, high-protein dish." Whisk eggs and egg yolk together in a bowl. Add Pecorino cheese and mix well. Heat olive oil in a large wok or skillet over medium heat; cook and stir pancetta until cooked through but not crispy, 2 to 3 minutes. Add the zucchini noodles (zoodles); cook and stir until zoodles are warmed but not soft and pancetta is slightly crispy, 3 to 5 minutes. Remove wok from heat. Pour egg mixture over zoodles and stir until evenly coated. Top zoodles with Parmigiano-Reggiano cheese and black pepper. Use a spiralizing device or mandoline to slice zucchini into noodle-shapes. The egg mixture wouldn’t cook through after you remove it from the heat. Also, the pancetta made it much too salty to eat. I used more than the recommended pancetta and it become way too salty. Will definitely try again!